France has denied information that the Financial headquarters of the proscribed Indeginous People of Biafra (IPOB) is located in that country. Political Counsellor, Claude Abily of the Embassy of France in a statement made to newsmen in Abuja yesterday said it is shocked by the statement attributed to Minister of Information, Lai Mohamed which claimed that the financial headquarters of IPOB is in France. Abily in the statement said France is ready to cooperate with Nigeria to investigate the veracity of the Federal government's claim, adding that France as a country have been given support to Nigeria in tackling her security challenges. 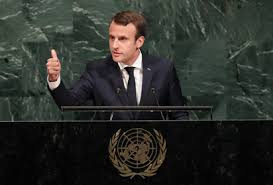 France also in the statement declared support for the unity of Nigeria. The statement read, "The Embassy of France was surprised by the statement made yesterday by the Minister of Information and Culture indicating that the "financial headquarters" of IPOB were in France. "We don't have any knowledge of a particular presence of IPOB in France and the Nigerian authorities never got in touch with the Embassy on this point. "We stand ready to examine any information which could support this statement. "Furthermore, we would like to reiterate that France actively cooperates with Nigeria in the field of security and that we strongly support the unity of the country.